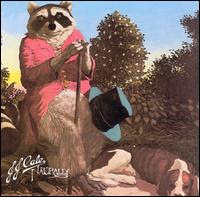 The story of JJ Cale’s first album is often told and re-told. Throughout the 60s he had played in numerous bands in his home state of Oklahoma, recorded several low-profile singles, worked in studios and played sessions for other artists. His friend Carl Radle had been working with Eric Clapton in the late 60s, and somehow managed to get Clapton a demo of one of Cale’s songs, “After Midnight”. Clapton recorded it and it became a hit. After its success, Cale was eventually persuaded to record his own album, produced by his friend Audie Ashworth, and his career had begun. Naturally had a subdued, earthy, laid-back vibe. Formed on a backbone of blues-rock but calling on influences from jazz and country, it had a surprisingly unique sound which Cale has since been able to make his own. The dominant sounds throughout were his near-whispered vocals and gentle, winding guitar lines. Many of the songs sounded almost like demos, being recorded with crude analog drum machines, but this only added to their charm. With Naturally JJ Cale was able to forge a unique new sound from deceptively simple forms, and this sound has come to define his career, being often imitated but never surpassed. I miss you too much, JJ. I have all your records (LP and CD).